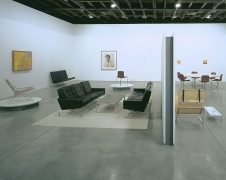 Sean Kelly and R 20th Century announce "The Furniture of Poul Kjaerholm and Selected Art Work," the first major American survey exhibition of the important Danish designer Poul Kjaerholm (1929–1980), which opens on December 10th, 2004. 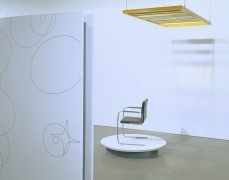 For this exhibition the two galleries will combine Kjaerholm's spare, elegant furniture with selected contemporary works of art in an exploration of the vibrant dialogue that has existed between contemporary art and modernist furniture collectors throughout the 20th century. The exhibition, designed and curated by John Keenen of the architectural practice Keenen/Riley, opens concurrently at Sean Kelly in Chelsea from 6pm until 8pm and at R 20th Century's Tribeca gallery from 5pm until 7pm. Architect Hanne Kjaerholm, Poul Kjaerholm's wife, will be present at the openings. 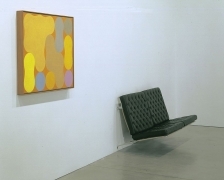 The exhibition continues through January 29th, 2005. Poul Kjaerholm's furniture appeals to serious furniture and art collectors for its understated elegance, clean lines and inspired rethinking of modernist iconography. It is no coincidence that Kjaerholm is highly sought after by art collectors as the perfect complement to the contemporary collecting environment. Poul Kjaerholm studied at the School of Arts and Crafts in Copenhagen, Denmark, where he would later teach, from 1952-56. He went on to become a lecturer and professor in the furniture and interior design department at the Academy of Art from 1957-76. Although formally trained as a cabinetmaker, Kjaerholm was a strong proponent of industrial production. 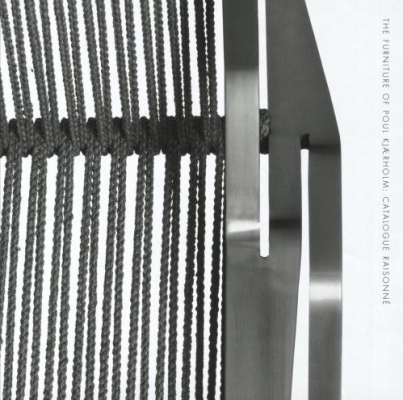 His work stands out among that of his Danish contemporaries because of his extensive use of steel-- at a time when most of his contemporaries were working exclusively in wood-- in conjunction with natural materials such as cane, canvas, leather and rope. Kjaerholm's career is an important chapter in the mid-century design movement and its far-reaching impact on contemporary art and design. 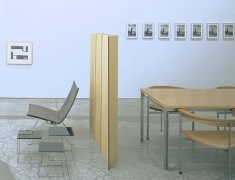 Kjaerholm pieces in the exhibition range from his earliest designs realized by Rud. 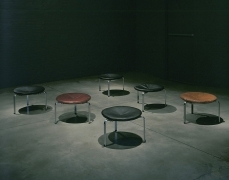 Radmussens and E. Kold Christensen Ltd., to rare pieces special ordered for the occasion from Fritz Hansen. One-of-a-kind prototypes, drawings and scale models handcrafted by Kjaerholm will also be on display. 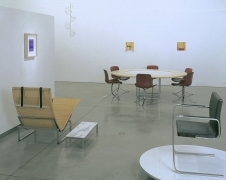 The relationship between the furniture and specific artworks has been carefully orchestrated and represents work by 20 artists including: John Baldessari, Francois Boué, Andrew Bush, Thomas Joshua Cooper, Rineke Dijkstra, Helmut Dorner, Iran do Espírito Santo, Jose Gabriel Fernandez, Liam Gillick, Callum Innes, Yves Klein, Joseph Kosuth, John Lindell, Robert Mapplethorpe, Lucretia Moroni, Carter Potter, Tony Smith, Frank Thiel, and Richard Tuttle.